STEALS & DEALS... to 80% OFF! Welcome to Lawrence Floor Trader's "Steals & Deals" Webpage! We do our best to keep the information on this website up-to-date with items as they come and go but current quantities can change from day to day as items are sold. Products are limited to stock on hand at any given time. These are closeout items! At this price, we will sell them to the first buyer (no holds or reserves) so if you see something you can use, DON'T DELAY! Items/prices will be added and deleted without notice. Day-of-Sale price takes precedent over any previously postings. The prices posted here are NOT usually shown in our store, only on this webpage. To take advantage of these liquidation prices, PLEASE PRINT the information about the item(s) you're interested in (or use your "Smart Phone" with webbrowsing capability in the store). Bring it with you and ask the associate to see particular items. We'll be glad to help you! Have fun saving money on these "Steals & Deals"! Let your friends and neighbors think you paid more when you get compliments. Your huge savings will be our little secret... unless you share it with them! "Terra Cotta" Ceramic Closeout. Glazed, 13"x13" ceramic tile. First quality closeout. Only 160 sq. ft. to start. Compare at $2.89 Additional stock not available. (Photo is a little dark. Tile is actually a little brighter.) No emails please. Call (785) 841-3838. Clearance Sales are final. A Lawrence Floor Trader Exclusive! Now only 1.64 per sq.ft. Final Markdown... 1.00 s.f, while it lasts! Wood Laminate Odd-Lot "Remnant Packs". Use your imagination... entry hall, small mudroom, playhouse? Great on the wall too! Use as Wainscoting or cover an accent wall. Great deals in our warehouse on one-of-a-kind-specials. Don't wait... get 'em while you can at up to 80% below the market. Special Buys! Assorted woodtones. Additional stock not available. Sold by the lot. No emails please. Call (785) 841-3838. Clearance Sales are final. A Lawrence Floor Trader Exclusive! 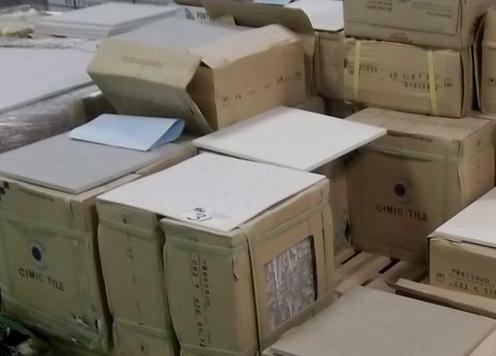 Ceramic & Porcelain Floor Tile Odd-Lot "Remnant Packs". Use your imagination... entryl, small kitchen, bath, utility room? 10-100 sq. ft. lots. Top quality "leftovers". Great deals in our warehouse on one-of-a-kind-specials. Don't wait... get 'em while you can at up to 80% below the market. Special Buys! Assorted sizes and colors. Additional stock not available. First come, First served. Sold by the lot. No emails please. Call (785) 841-3838. Clearance Sales are final. A Lawrence Floor Trader Exclusive! House Make-Over and Rental Property Fix-Ups! We've got you covered! Carpet from 77c sq. ft. Loops, berbers, textured plushes. Great deals in our warehouse on one-of-a-kind-specials. Solid colors, tweed blends, we've got it! Don't wait... get 'em while you can at 40%-60% below the market. Special Buys! Additional stock not available. Assorted rolls.. No emails please. Call (785) 841-3838. Clearance Sales are final. A Lawrence Floor Trader Exclusive! Just a few rolls in stock that are great for makeover or rental properties. Subject to stock on hand. One-of-a-kind closeout rolls at closeout prices! New items added as they become available at the carpet mills. Stop in anytime!